As a Location Manager in the Film and Television industry in Canada, it is my responsibility to handle the logistics of filming. One of the projects in 2007 was a C.B.C. TV series called “Heartland”. 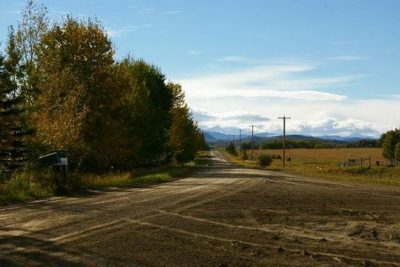 Our main set was located 3 km down a gravel road, where there are probably 10 acreages. Dust abatement was part of our agreement with the local M.D. office, so I started to look at different options. A water truck is the most common way that a Movie Company controls dust. Most shows are only in one area for a short period of time, but “Heartland” would last 5 1/2 months. The water truck would have been extremely expensive, and the water applied everyday to a road increases the need to grade the road. Oil was a very expensive option and it would have to be reapplied throughout the season, as well as the hazardous environmental impact oil causes. The residents of this road walk along it and ride their horses beside the road all the time. We needed something that would be less expensive, last a long time, and be environmentally friendly. I talked with Gil Howell from Cypher West Ltd. and he told me about the “Dust Stop®” product. At first I was somewhat skeptical about it – “apply it once with a water truck and it will last for months”. A huge amount of traffic on a road that used to have 10 vehicles a day. I thought this dust control would maybe last a week – a month at most. I was surprised and happy to see that our one time application in July lasted until October. When the snow came and dust was no longer an issue. We could not believe that even after the MD graded the road throughout the summer that the “Dust Stop®” still kept the dust down. I was extremely impressed. This year the MD put a cold pavement on the road, but when there are more movie locations on gravel roads I will make sure that I use “Dust Stop®”.